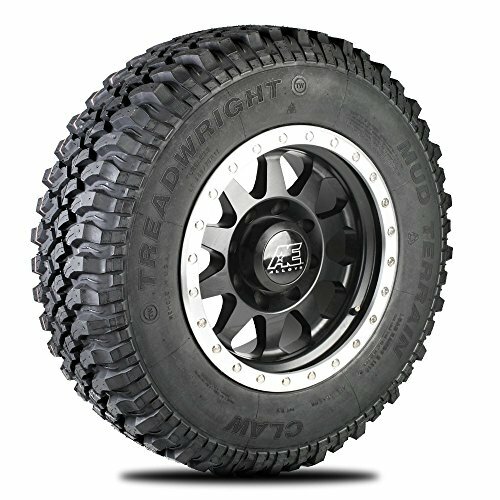 The Claw has a classic, rugged and aggressive look that will have everyone doing a double take.The Claw is TreadWright's answer for an aggressive tread design that at its core is a mud-terrain, but with design features that truly make it an any-terrain tire. The enhanced footprint, provides an aggressive off-road appearance, improves rock climbing and glossy surface traction but performs equally well on dry and smooth surfaces. It is designed to accept #17 studs. If looking for versatility and great performance, this one delivers. TreadWright has been manufacturing remolded tires in the USA for over 30 years. TreadWright uses a remold manufacturing process that is nearly identical to new tire manufacturing. The process starts with a premium casing (Goodyear, Michelin etc.) that has passed a complete integrity inspection. Occasionally we will repair and vulcanize a pinhole leak in an otherwise approved, quality inspected casing. The used tread is buffed off the casing and then completely rebuilt with a new commercial grade tread compound. The rebuilt casing is then remolded with the same presses and manufacturing processes used to cure new tires. These Bead to Bead tires have additional rubber added to the sidewalls and they are remolded with our TreadWright brand. The tread is a commercial grade rubber compound, which has proven to provide up to 25% more tread life than comparable imports in on/off road terrain. Recycled/remolded tires are used in 80% of commercial airlines, emergency response vehicles and school buses all across the US. The DOT has determined that remolded tires and new tires have the exact same defect rate. TreadWright Tires are produced with 70% recycled materials. Each TreadWright tire uses approximately 6 gallons of oil compared to 18 gallons for a new tire. Join the Remold Revolution! If you have any questions about this product by TreadWright, contact us by completing and submitting the form below. If you are looking for a specif part number, please include it with your message.